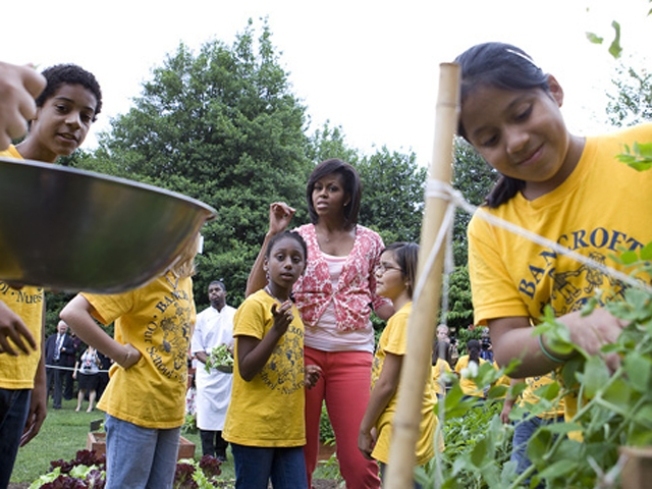 First Lady Michelle Obama hosts the Bancroft Elementary School for the garden harvest of the White House in Washington in June. Berkeley chef and slow food advocate Alice Water's dream of an organic garden at the White House is quickly turning into a nightmare. In March, First Lady Michelle Obama planted an organic garden on the White House grounds partly in response to a letter from the chef of Berkeley's Chez Panisse, urging the first family to do so to "demonstrate to the nation and to the world our priority of stewardship of the land." But what was suppose to be Water's shining moment has turned into a toxic dump, literally, in just a few short months. On Friday it was revealed that Mrs. Obama's organic vegetables were fertilized by toxic sewer sludge. Daily Finance, which first reported the story, said the practice is "fairly common...with one huge problem:" the sludge is often laced with heavy metals poured down people's drains. The National Park Service tested the soil in the White House garden and found while the land had "highly elevated levels of lead averaging 93 parts per million," it was still under the Environmental Protection Agency's level considered to be a threat to human health. But the main problem is while the food may still be safe to eat, the garden can never obtain organic status as long as the toxins exist in the ground. But the Obamas were not the culprits of a left wing toxic fertilizer conspiracy. Who is to blame for the problem? None other than the Clintons of course.